Now ready for pre-order! Click here to read more. 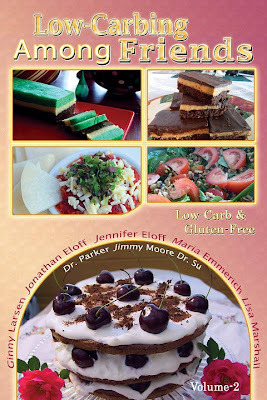 This is the 2nd in a new series of cookbooks from Jennifer Eloff and her ever-expanding team of authors, doctors, low-carb experts, and cookbook writers. All the recipes are low-carb, gluten-free, wheat-free, and sugar-free, and all have been cross-checked with a variety of sweeteners so you can use the ones you prefer. This book, as well as Low-Carbing Among Friends, Vol 1, will be available either perfect bound, or for a few dollars more, coil bound. Coil binding allows the book to lay flat, an especially useful thing for cookbooks. Click on the link above to see the images scrolling across the top of the page for a preview of some of the yummy things included in this unique series. Pre-orders are in effect till around mid-August, and you can save on the book, S&H, coil binding, and multible books by ordering before then. (It’s not too eary to start thinking about Christmas gifts!) The preferred order page is http://amongfriends.us/preorder5.php.